Today, with the Genomic Revolution underway, it is getting easier and easier for employers and health care providers to access your genetic information. Louise believes that information should be protected the same way as other personal information – and not used to discriminate. Louise authored the landmark Genetic Information Nondiscrimination Act (GINA), which was signed into law by President George W. Bush in 2008 after a fourteen-year battle in Congress. Prior to GINA, employers could fire or refuse to hire someone based on their family history of breast cancer or other hereditary illnesses. Louise also continues to oversee the implementation of the law and evaluate whether policy improvements are needed to keep your genetic information safe. 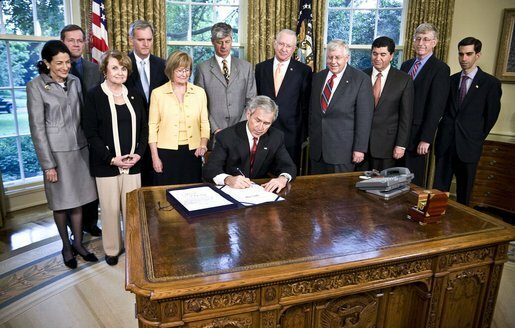 President George W. Bush Signs Into Law Louise Slaughter's Landmark Law Banning Discrimination Based On Genetics.